PROVIDENCE — Democrat Gina Raimondo has defeated Republican Allan Fung to become the first woman elected Rhode Island governor despite being snubbed by some prominent labor groups. Raimondo’s victory Tuesday over the Cranston mayor also makes her the first Democrat elected to the job since 1992. As of Monday, Raimondo had 131,452 votes (41 percent) to Fung’s 117,106 (36 percent). Moderate Bob Healey had 69,070 (21 percent). The 43-year-old state treasurer was favored going into the general election but struggled to consolidate public-sector union support following her 2011 pension overhaul. Fung, 44, also opened a big money lead after an infusion of matching funds. A native of Providence, Fung, who described himself as moderate but fiscally conservative, would have been Rhode Island’s first Asian American governor. 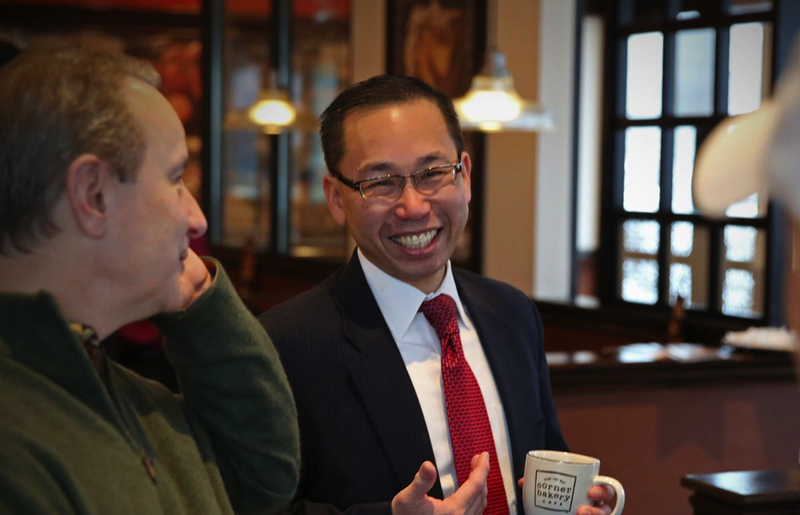 He served on the Cranston City Council from 2003 to 2007 and was elected mayor three times starting in 2008, making history by becoming the state’s first Asian American mayor. Previously, he was a prosecutor in the Rhode Island Attorney General’s Office. National figures became involved in the gubernatorial race. Fung’s supporters included New Jersey Gov. Chris Christie, chair of the Republican Governors Association, and former Massachusetts Gov. Mitt Romney, who said that Fung has “proved himself as the mayor and is about to prove himself as the governor.” First Lady Michelle Obama urged voters to “get it done” for Raimondo and warned that the race would be close. Former Secretary of State Hillary Clinton also campaigned with the Democratic candidate. Raimondo will succeed Gov. Lincoln Chafee, who decided not to run for re-election. A former Republican, Chafee was elected as an independent and switched to the Democratic Party last year. Earlier this year, there was a possibility that former Olympic figure skater Michelle Kwan would be Rhode Island’s next first lady. Her husband, Clay Pell, grandson of the late Sen. Claiborne Pell, was a Democratic candidate for governor. He and Providence Mayor Angel Taveras lost to Raimondo in the primary. In New York, Columbia University law professor Tim Wu lost to former Rep. Kathy Hochul in September’s Democratic primary for lieutenant governor. Gov. Andrew Cuomo had tapped Hochul to be his running mate. Wu criticized Hochul as being too conservative. Cuomo and Hochul won the general election on Tuesday. The region has already had an Asian American lieutenant governor. S.B. Woo, a Democrat at the time, served in that capacity in Delaware from 1985 to 1989. He later ran unsuccessfully for the U.S. House and Senate. The first Asian American governor in the continental U.S. was Gary Locke, who was governor of Washington from 1997 to 2005. He later became U.S. secretary of commerce and U.S. ambassador to China. The nation’s first Asian American governor was George Ariyoshi, who served as governor of Hawaii from 1974 to 1986. His successors John Waihee (1986-1994) and Ben Cayetano (1994-2002) were the first Native Hawaiian and Filipino American governors, respectively. Democratic State Sen. David Ige was elected on Tuesday to succeed current Gov. Neil Abercrombie.